With all the fruit at hand I had to change my plans to take care of as much of it as possible today. It's a task I enjoy — but maybe not when I'm trying to get organized to go away for a couple of weeks. I like the contemplative part of peeling and cutting so even if my body spent the morning in my kitchen my mind traveled the world and I went from one decade to another in seconds. 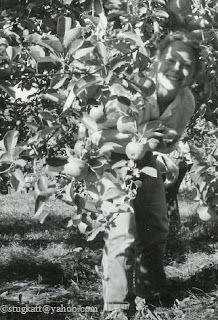 Thinking of how we went to different apple farms in New England to pick apples. Something we don't have here so I asked a million (more or less — probably more) questions when the owner turned up. My questions must have been adequate as the owner asked me where I had my apple farm. My mind wandered to Winnipeg and the fall I spent there — I remember how odd I thought it was when we picked the last strawberries in late October. A bit surprising as I was told it was too cold to grow apples there. Thinking about thinking made me think (hope you can follow the thinking here) of how I and a colleague discussed our jobs — she said she always listened to the radio while weaving and I said that I very seldom did that as weaving, if it's not a too complicated pattern, is perfect for letting the thoughts wander. But I don't want to think, she said. Thoughts are not always pleasant. I'm most grateful for a life on the sunny side where unpleasant thoughts have been rare. 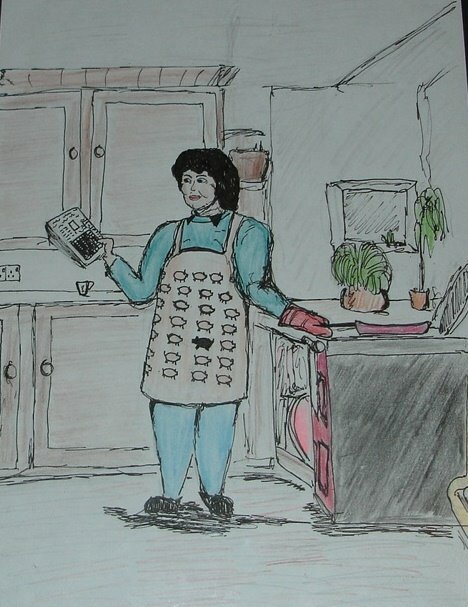 It is late afternoon here and I've just had tea and decided not to spend any more time in the kitchen today. You don't have to be clairvoyant to figure out that I'll be quite busy tomorrow; doing everything I meant to do the last couples of days. I have all my lists from previous trips to the island saved in the computer; how much food we left, how much food we use, which clothes we left and what to bring. In the future I'll need to make o copy of the lists as I have no use for them if the computer refuse to work. What a productive time you have been having. I have had so many visitors this summer that I have had no time for preserving fruit. I am very curious about your dehydrator and apple leather. I feel a new distraction calling me. 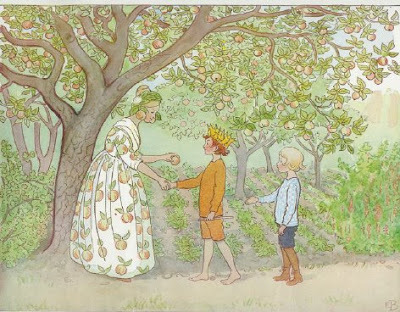 I followed the link to the work of Elsa Beskow, whom I had not heard of before; I really like the pictures I saw. I wonder if any of her books are available in England? Monix, I'm sure you can find more information about drying fruit on the web. Yesterday I had a picture of the whole dehydrator (almost the whole thing) the round red thing to the left of the apples. Your library might have books about it too. Thank you for the new link, Margaretha, what a tragic life Elsa Beskow had. I have found several of her books on Book Rabbit and I will be adding them to my picture book shelf. Dehydrators do not appear to be easily available here and I certainly haven't heard of anyone among my friends using one. I will think about that for next year but for now I will try my hand at making apple butter. I found a recipe in a very old farmhouse cookery book.